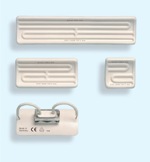 Elstein FSR panel radiators are ceramic infrared radiators, which are designed for operating temperatures up to 750 °C. Surface ratings of up to 64 kW/m² can be installed. 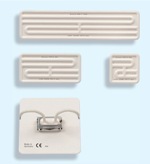 FSR series radiators are characterized by their concave design. Due to the design of this type, there is a space between the radiator and mounting plate, which reduces the heat absorbed by the wiring space. FSR panel radiators can be used universally and are suitable for assembling radiation areas with any geometry required. With its FSR panel radiators, the company Elstein-Werk has been setting design, type, power and quality standards, recognized worldwide since 1952, for ceramic infrared panel radiators. 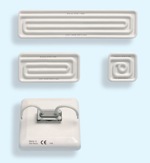 Elstein FSF panel radiators, are ceramic infrared radiators with a low overall height. They are designed for operating temperatures up to 750 °C and surface ratings up to 64 kW/m². Compared to other Elstein panel radiators, the overall height of the FSF radiators, measured from the radiation surface up to the mounting plate, has been reduced by approximately 45%. Elstein HTS high temperature radiators are ceramic infrared panel radiators, which can be used for operating temperatures up to 900 °C and surface ratings up to 64 kW/m². HTS series radiators are filled with thermal insulation material. 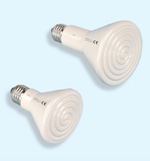 This improves the radiant power output to the material to be heated. There is a significant reduction in heat dissipated in the wiring space, so that additional insulation of the heating area is usually not required. HTS radiators have a considerably reduced heating-up time and, depending on the type of application, enable energy savings of up to 25 %. .
Elstein IOT/75 and IOT/90 radiators are ceramic infrared dark radiators with E27 screw caps. The standardized E27 thread allows easy and safe installation, as the radiators can be screwed in like bulbs into porcelain or metal sockets with porcelain insert. Due to their simple connection, IOT/75 and IOT/90 infrared radiators are suitable both for individual operation and for configuring groups of radiators. They have diverse applications, in particular they range over terrariums/pets and livestock, breeding, medical and catering technology. The power can be adjusted using a proprietary dimmer.